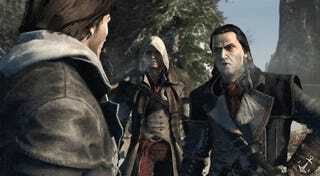 Assassin's Creed Rogue was released in November 2014 and almost immediately forgotten. Which was a shame, since it was pretty good, but also understandable, since Unity was both louder and flashier. Well, the delayed PC release of Rogue is hoping to make up for that. If you're curious to see how it looks, I've recorded the opening section of the game below, which with its mix of stealth, combat, cutscenes and naval action will give you a pretty good idea of how it shapes up on a more powerful platform. Note that this was at max settings, so if you think things still look a little muddy (especially compared to Unity), remember, it's an Xbox 360/PS3 game at heart. It's funny going back and playing Rogue now, having sunk so much time into Unity, and seeing that despite its "age", it still plays so well. Sure, you first notice that everything looks blander, and the animation itself is more sluggish, but your actual control over Shay — while far from perfect — is still more refined than Unity's skittish madness.